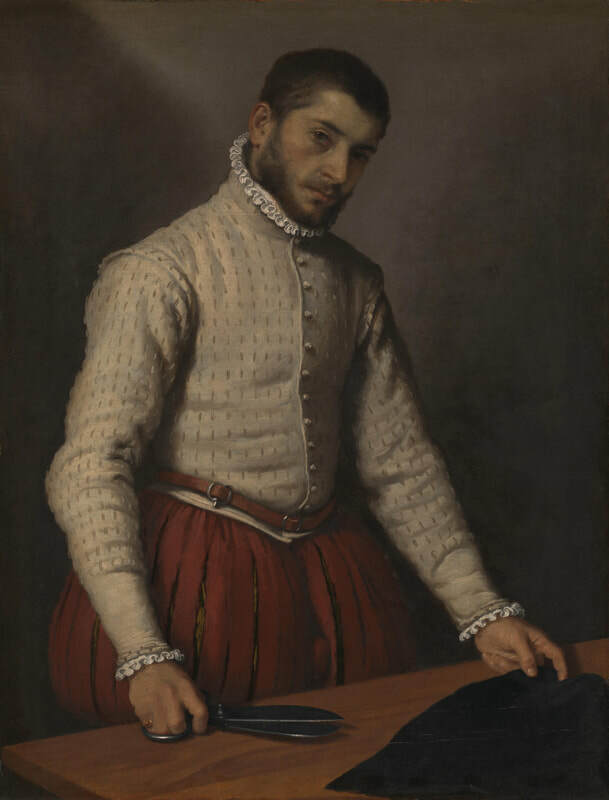 “Moroni: The Riches of Renaissance Portraiture” at New York's Frick Collection reconsiders the work of the Northern Italian portrait painter Giovanni Battista Moroni. It presents some 20 of his works along with period objects similar to objects depicted in Moroni's paintings. The items on exhibition have been assembled from several collections around the globe. Moroni, the son of an architect, was born in 1525 in Albino, then part of the Venetian Republic. He studied art with Moretto da Brescia. His first real recognition as an artist came when he visited Trent in the late 1540s. Trent was then a focal point of the Catholic world as the Council of Trent was taking place there, developing a response to the Protestant Reformation in Northern Europe. Moroni was commissioned to paint two portraits of the Count-Bishop's sons. He may have met Titian there who it is believed commented favorably on Moroni's work. Still, Moroni's career was for the most part, that of a regional artist. He never went to the artistic centers of Venice or Florence. Indeed, this may be the reason why he was omitted from Giorgio Vasari's landmark Lives of the Artists, which recounted the lives of the major Italian artists of the Renaissance. In any event, Moroni's career primarily involved painting portraits of the petty aristocracy and bourgeoisie of Albino and nearby Bergamo. Nonetheless, Moroni's works have not been free from controversy. In the signage leading into the exhibition, the Frick points out that Moroni had the ability “to capture his sitters exactly as they appeared before him.” However, it goes on to note that “critics have, at times, derided artists seen to imitate their subjects too closely, foregoing selection, editing and adherence to ideals of beauty.” Such critics have dismissed Moroni as an uninventive documentarian. However, with this exhibition, the Frick challenges that conclusion arguing that Moroni “enhanced the immediacy of his sitters with close crops, dramatic lighting, nuanced facial expressions and dramatic poses.” It notes that he experimented with genre and with format and that his narrative portraits anticipate the work of Rembrandt in the next century. Moroni clearly had a great ability to produce realistic images. This is true not only of the faces in his portraits but also of the drapery and peripheral objects in the paintings. Indeed, a comparison of the paintings with the 16th century objects included in the exhibition reveals just how precisely Moroni rendered such objects. But a faithful rendering of a person or an object is not enough by itself to make a great portrait. The objective of a portrait is to capture and present something essential about the person who is the subject of the portrait - - something of the sitter's soul. For this reason, the name or identity of the sitter is unimportant. As long as the artist has created a connection between the viewer and the subject, nothing more is needed. Indeed, an exact physical likeness is unnecessary as the portraits of Matisse demonstrate. Moroni did have the ability to create such connections. He did so in his best known work The Tailor. However, such connections are also present in lesser known works such as Gabriele Albani and Portrait of a Young Woman. In such works, something of the life force of the sitter is communicated across the centuries. However, Moroni sometimes failed to make such connections. Some of his portraits appear manufactured. Indeed, it is known that for some works, only the sitter's face would be rendered from life. Another person or a manequin would then be used for the painting of the body and clothing. Consequently, in some of the paintings, the head and body do not match or the proportions are off. One gets the feeling that the artist did not really care. Along the same lines, Moroni did a series of paintings in which his customers are shown praying while an incident from the Bible is taking place in the background. However, these appear to be assembly-line works akin to the souvenir photographs taken on cruise ships where the passengers pose in front of a backdrop showing the cruise ship. In such photos, it is obvious that the people were not standing in front of the ship when the photo was taken. So too here, if you follow the customer's eyes, he or she is not even looking at the Biblical scene taking place in the picture. Moroni's work also suffers by comparison. The Frick's permanent collection includes room after room of great portraits. In addition to the Titians, Hals and Rembrandts, there are Holbein's portraits of Sir Thomas Moore and of Thomas Cromwell. Somewhat lesser known are Sir Thomas Lawrence's Lady Peel and Goeroge Romney's Lady Hamilton - - paintings that almost speak. Gainsborough, Reynolds, Renoir and Whistler are also represented. While the identities of the sitters in most of these paintings are known, that is not what matters. They are great paintings because the artist has drawn a connection between the subject and the viewer. Still, this is a worthwhile exhibition for several reasons. First, as discussed earlier, it includes works that do draw a connection between the subject and the viewer. Second, for artists, particularly those interested in photo-realism, Moroni's ability to render detail so precisely should be instructive. Finally, the juxtaposition of the paintings with 16th century objects makes the exhibition seem more immediate. As a result, the controversy over the place of Moroni in the history of art becomes more interesting and relevant. 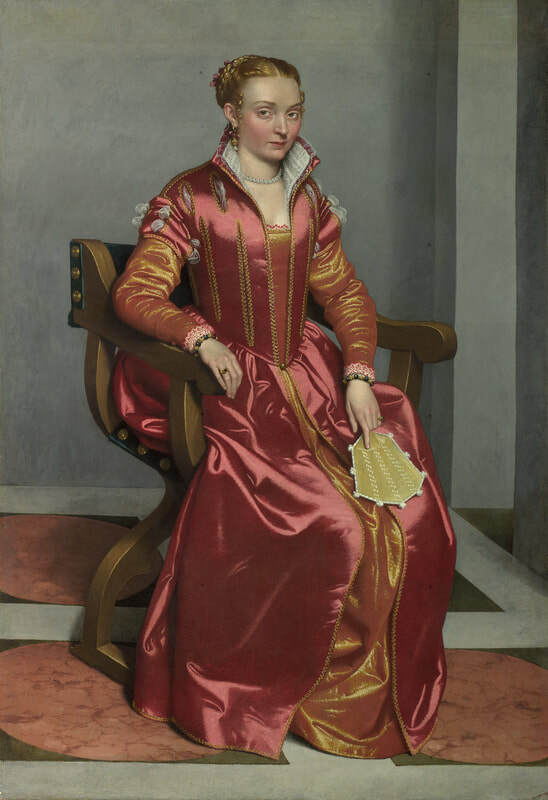 Two of Moroni's best known and most successful works: The Tailor (above) and The Lady in Red (Lucia Albani Avogadro) (below). (Public domain Wikimedia).